Welcome to your own Kop in Delhi. DelhiKop – Liverpool Delhi Supporters’ Club – is the Official Liverpool FC Supporters Club for those residing in Delhi/NCR and nearby areas. As DelhiKop, we do not just share our passion for the club, but also try to live by the values that our club stands by. We never let a fellow fan/friend walk alone. DelhiKop was formed in 2007 when three friends – Anirudh, Ankit and Manan – got together to watch a Liverpool game at a local pub. What followed since was how a group of friends grew to become a supporters’ group and finally being recognised by Liverpool Football Club as an Official Liverpool FC Supporters’ Club on 13th February 2013. DelhiKop provides a full community feeling to the fellow Reds. Screenings: We usually gather at Spirit Bar and Restaurant in Connaught Place for most of our games. The entry is free and there is no cover charge either. This might change if the venue changes and/or if we are screening a big game. However, we do try to keep the entry barrier as low as possible. Football Days: Once in a while, we get together at a ground that’s convenient to most of us (say, India Gate grounds) and try a kick-about. Competitions: We also run competitions from time-to-time. Be it any special occasion or our season long Premier League Fantasy Football game ‘DelhiKop SuperLeague by Red Label’, be sure to participate in them to win some exciting goodies. Shop: DelhiKop is sponsored by Red Label for competitions and for general administrative expenses. They also produce exclusive DelhiKop merchandise. 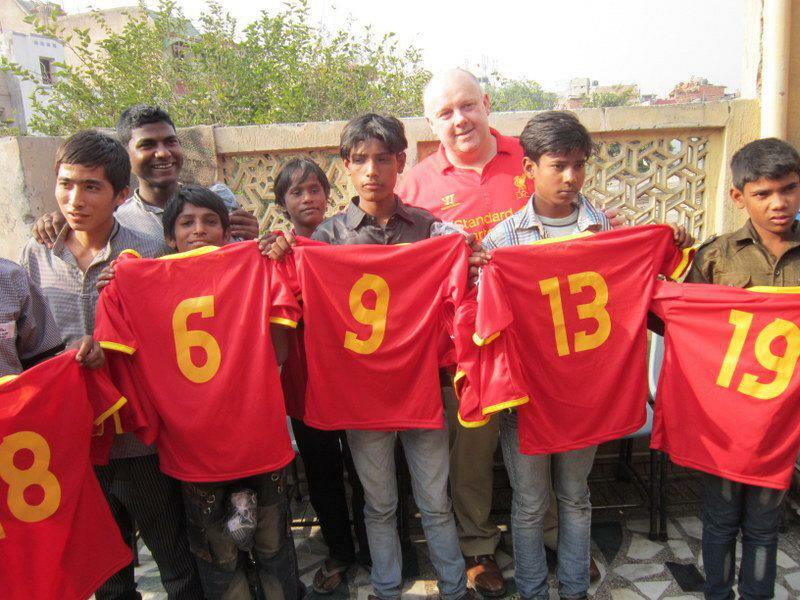 Charity: Through Jamie Carragher’s 23 Foundation and their Asian Ambassador – Steve Parry – we support a local Delhi charity, Butterflies, which works for betterment of street and under-privileged children in Delhi. We encourage all fans to make generous donations to their cause. We distribute LFC merchandise to the kids as well as organise regular footballing events for them. So far we’ve given them close to ₹70,000 in cash donations, LFC and DelhiKop shirts, footballs and training cones as well as custom-made football shirts for the entire team as well as 25 pairs of football boots. Being a part of DelhiKop is easy. It’s free too. Visit our Membership page! DelhiKop is also available on Facebook and Twitter.